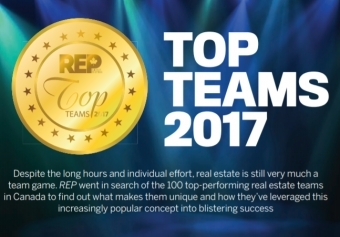 Real Estate Professional (REP) magazine has just released its 2017 Top Teams report, recognizing Shawn Zigelstein's Team Zold, among 100 of Canada’s most successful real estate teams. Reaching a point in your career where starting a team is necessary is a fine accomplishment, but turning that team into a successful entity is even more impressive. In the latest issue, REP highlights the top-performing real estate teams who have achieved their goals year in and year out—showcasing not only the vision and mentorship of their leaders but also the skill and commitment of the agents and support staff working to build the team’s brand.